Also known as the Mustang Mach 1, this classic style '71 fastback embraces a modern driveline and suspension, crafted carefully by the folks at Jeff Lilly Restorations. 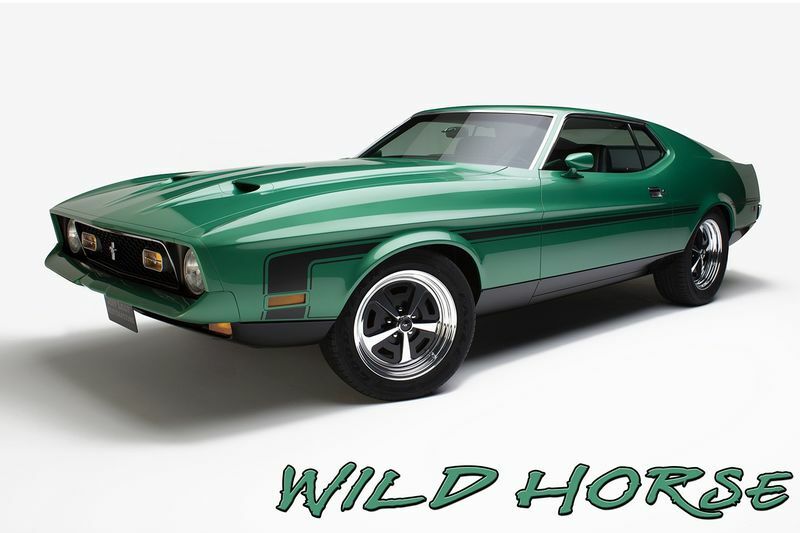 Ken Lowe is the man who became the proud owner of this beautifully restored Mustang called the Grabber Green Metallic Filly. Ken grew up with the love of cars thanks to his family being true car fanatics. His dad eventually started selling cars in the mid-'60s at Simmons Ford in North Carolina, and his mom was said to have quite a bit of a lead foot herself. In the late 60's when Ken was only 16-years-old he got his first car, a 3-year-old '63 Ford Galaxie fastback with a 428ci engine. Ken recalls it running like a rocket and loved the car dearly. However, he longed for his first brand new car and, when he had eventually put away enough money in 1971, Ken ordered the brand-new Mach 1 Mustang through his dad at Simmons Ford. "To this day, I don't think I've ever been more excited as I counted down the days for that Mustang to be built in Detroit and shipped to Pilot Mountain, North Carolina. My dad and I stood side by side the day the driver rolled the shiny new green Mustang off the transport. The feeling of slipping behind the wheel and cranking up that 351 Cleveland motor was exhilarating, I can still recall it to this day," Ken explains in admiration. Many loving miles were put on the car before handing it down to his brother Bruce, who enjoyed years behind the Mustangs wheel as well, eventually putting out to pasture at their father's farm. There, Ken's dad drove, tinkered with, and admired the car for another few years. Thankfully Ken got the itch to have the Mustang restored so he could once again experience the exhilaration of being behind the wheel. He decided to ship it off to Jeff Lilly Restorations in San Antonio, where the beloved family car would get a complete makeover. The bodywork received rust repairs, tightening of the panel gaps and laying down of the new Grabber Green Metallic Paint. The engine was replaced by a much more powerful 351 Windsor Crate V8 engine, handling the extra horsepower is a TCI AODE transmission that ensures the Mach 1 can comfortably trot along at today's highway speeds. Underneath the new paint is a total Control Products suspension upgrade, including coil-over shocks at all four corners, and the company's trick pushrod rear suspension with torque arm. The Mach badging was removed as it was decided that it didn't make the car look as clean. Everything was monitored and controlled by Jeff Lilly himself and the result is a different kind of stock appearance which I'm sure we can all appreciate it. Rear: Wheel Vintiques Magnum 500, billet aluminium, 18x8, 41/2-inch BS. All fender, and bumper gaps tightened & Xenon headlight conversion. Video: 2019 Ford Mustang Bullitt Revealed! Video: Speed Dating Gone Wrong!